Switch Grass - Panicum virgatum. Switchgrass is a type of bunch grass, meaning that it grows in clumps or bunches. Because of its deep roots and ability to withstand conditions of drought and high temperature, switchgrass plants are quite hardy. Switchgrass is native to North America, primarily the prairies of the Midwestern United States. If left untouched, it can grow as high as eight feet tall. It thrives best in warmer temperatures with lots of sun exposure. Flowering time can be around 2 to 3 weeks in ideal conditions and 3 to 4 weeks otherwise. Best of all, it can grow in moderately moist soil or even dry conditions. Switch Grass is commonly known as Panicum Virgatum. It can grow well in areas that have a warm season. They are found growing in vast prairies and used in soil conservation or ornamental grass. They can also be referred to as thatch grass, wild redtop, or tall prairie grass. They have deep roots, and the grass can grow in late springs. This is a self-seeding crop, and once the seeds are ready, they will blow in the wind and disperse themselves. They can live up to ten years or longer. Switchgrass is a tall type of grass. It is a tan, green color. Plus it looks cool around ponds and rivers. It is a type of grass, so it just keeps growing and growing. It doesn't have a particular height. If you are interested in getting some Switch Grass go for it, you won't regret it. Switch Grass is a native grass that is a slow grower. The leaves are hairy, and dragonflies, birds, and fish love them. 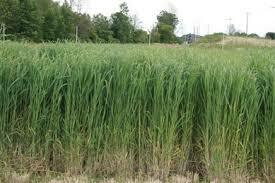 The Switchgrass is often found planted around ponds, lakes and water areas along the banks. Fish love hatching their eggs in the roots. It is a relatively tall plant and does well in hot, humid climates. This grass looks excellent planted around a water garden or an area that needs something to attract dragonflies and butterflies.